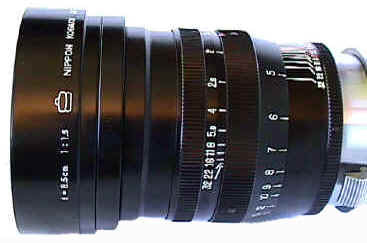 The 85/1.5 Nikkor is one of the key lenses for Nikon collectors. It's the fastest telephoto made for the Nikon Rangefinder System. Easily scratched by virtue of its own weight in a camera bag, it's exceedingly difficult to find in Mint- or better condition. The 85/1.5 came with its own special reversible hood and lens cap. Several hundred were also made in Leica Screw Mount and Contax mount. 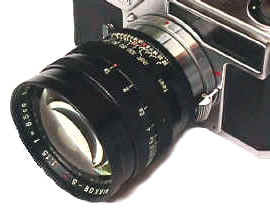 The Contax lenses are marked with a large "C" on the lens barrel. An 85/1.5 was mandatory in the Rangefinder System races of the late 50's since both Leitz and Canon had their own 85/1.5's. For the photographer at the time, it offered speed that no other lens could better in a portrait focal length. For the collector today, it offers an example of traditional craftsmanship in a very rare package. Performance? By today's standards, all three 85/1.5's are lacking wide open, but improve much by 5.6 and beyond. This is one of the few Nikon Rangefinder lenses which were only made in black. Today it is one of the most sought after lenses by Nikon collectors. Never made in Nikon F mount, the 85/1.5 lives on today in the 85/1.4 AF Nikkor.